Herman Brot Lower Carb Bread, Lower Carb Pasta and Protein Muesli range have been created to embrace dietary characteristics that are integral components of healthy eating; low carbohydrate, high protein, low glycemic index, provided from whole-grains and legumes. This unique combination of attributes makes this tasty, nutritious bread and pasta an excellent inclusion in anyone’s diet. Made from the best local and imported ingredients the Herman Brot products are free from artificial colours or preservatives. The macros on these products are extraordinary. All products are unique in the market and have no competition at all. The values are by far the best in the entire health food industry and suit perfectly for: weight loss, people with diabetes, vegetarians, vegans, people on a ketogenic diet, fitness and sport. As well as having access to such a low carbohydrate bread, Diabetics will also delight in a bread that has a GI rating of only 24 and a Glycemic load of 1. With most companies struggling to sneak their breads into the low GI category of under 55, this bread clearly takes the title of the lowest GI and GL bread on the market. (Tested and endorsed by the Sydney University Glycemic Index Research Service (SUGIRS). And if those statistics don’t get you interested, the bread also offers 26g of protein per 100g, making it a perfect source of protein for vegetarians and anyone looking for a protein alternative. Find out more. Herman BrotⓇ Low Carb Pasta has only 5g of carbohydrate per 100g, an incredible 39.4g of Protein per serve and GI22 and will bring delight to the tastebuds of pasta lovers all over the country. Boasting incredible figures, pasta is now back on the menu and you can create easy meals in minutes. With 39.4g of protein per serve all you need to do is add their fresh vegetables and sauces and you’ll have a completely healthy meal that can be prepared in under 10 minutes. 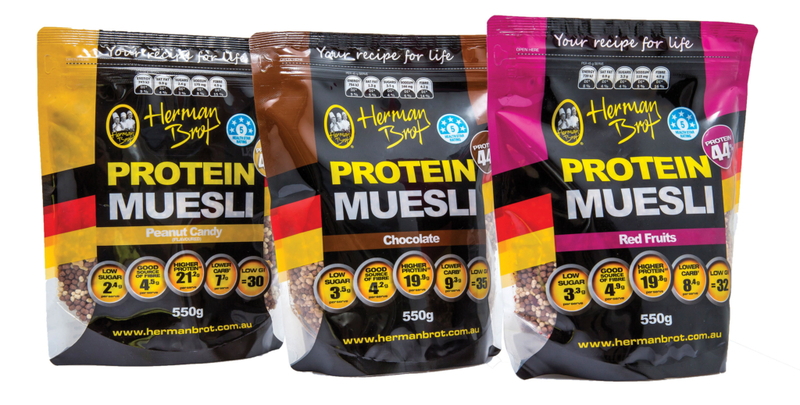 Herman BrotⓇ Protein Muesli is available in 3 flavours – Peanut Candy, Red Fruits and Chocolate and stands out as No. 1 choice in a breakfast cereal category that is often full of not so healthy options. Most cereals often full of hidden sugars and promoted to consumers as healthy (using creative and gimmicky marketing techniques); Herman Brot are proud to have created a staple food with no artificial colours or preservatives, and another product that has macros that are very hard to compete with. The highlight of the muesli is the amount of plant protein found in each serve. Peanut Candy = 21.2g/45g serve (47% protein) | Red Fruits = 19.8g/45g serve (44% protein) | Chocolate = 19.9g/45g serve (44% protein). Want to prepare some nutritious meals and need some inspiration? Check out our recipes and download our recipe book with some delicious bread and pasta meals that can be prepared in minutes. All recipes were prepared in consultation with Herman BrotⓇ dietitian Julie Albrecht and include complete nutritional breakdown. See how easy it is to incorporate Herman BrotⓇ Lower Carb Bread and Lower Carb Pasta into your life. Herman Brot – Your Recipe for Life! I have avoided bread for the last 12 months due to the carbs and making me feel “bloated”. My wife brought home your bread tonight from IGA Maroochydore and initially hesitant, thoroughly enjoyed it! Thank you so much for this – 5g of carbs is sensational and it tasted fantastic – thank you! Hi, just wanted to say ‘thank you’ for letting me know the bread was available at IGA, Wises Road, Maroochydore. I purchased some loaves yesterday and the bread is great; amazing. So light! I haven’t been a bread eater for a long time due to the heaviness it left me feeling. Thank you again and will continue to purchase same. Congratulations and well done. Loving it!!! Thank you so much for getting back to me so quickly, much appreciated. We are getting brands, foods, recipes etc…together and keen to get started asap. Wow thank you so much. We are super happy to try this bread as it has come highly recommended from our Dietician at Westmead children’s hospital. To cut out bread altogether on the ketogenic diet might be a bit hard for Austy – so to have other options like your bread and to hear positive feedback too is great.